Jackie and Judy made some interesting comments about the North Ronaldsay sheep on my Rare Breed Sweater update. So I have spend several days pulling together a few things to share. I have long been interested in collecting samples and information about as many different breeds of sheep as possible, but I find the rare breeds especially intriguing. I was introduced to the North Ronaldsay breed through an Online Guild Rare Breed Challenge. It was led by Elizabeth Lovick, who lives in Orkney. She sells and works extensively with North Ronaldsay yarns, and kindly provided these photos. 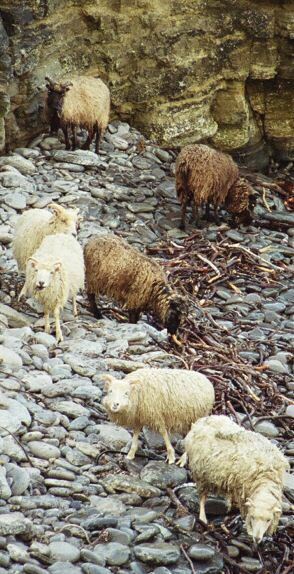 North Rons are an ancient, primitive, and once feral breed of sheep, named for North Ronaldsay, the island on which they once resided exclusively. They are intelligent, agile, sure-footed, and difficult to catch! Being a primitive breed, they have short tails and actually shed if not shorn. They roam the island in loose herds, eating seaweed washed up on shore. In late April, the pregnant ewes are caught and taken into care by their owners, as lambing is in early May. Ear clips identify which sheep belong to whom. A second round up occurs in August, when the sheep are inspected, clipped, injected, and dipped. Each shepherd receives a percentage of the total clip, depending on how many ewes are owned. With a world population around 4500, North Rons are classified as 'vulnerable' by the Rare Breeds Survival Trust (UK). The majority of these remain on the island of North Ronaldsay. The fleece is dual coated (another primitive breed characteristic) and comes in every color imaginable, from chocolate to white. 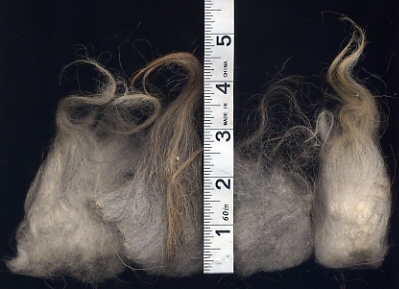 Fleeces are processed at a local mini-mill, where the guard hairs are removed by centrifugal force. 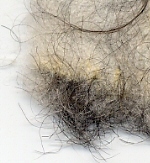 While the two coats are easy to separate by hand, the real bugaboo are these little black kempy hairs (pictured at right) which I ended up pulling out semi-successfully by hand. The amount of guard hair in a fleece varies according to color; chocolate having the least. Below are some samples from the fruit of my labors for the challenge. The range of colors is lovely, and getting them out of their storage box once again reminds me that they are still awaiting a project. I reckon thinking about that will be one more pleasant way to spend my time as I continue knitting on my sweater. Hello Leigh! Neelix, Sinda & I would like to thank you & Rascal for visiting us this morning! Yes, I am learning how to spin - the description you gave of the North Ronaldsay sheep is extremely close to Shetlands. 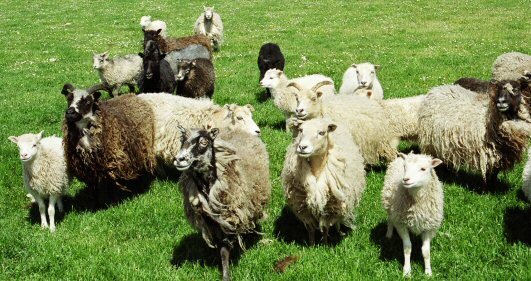 Will you be including Shetland sheep/wool in your rare breeds sweater (which is exquisite! by the way) Our little flock is at 9 right now, (we've had as many as 16 and as few as 5) but two - Lucy & our ram Thorson will be going to new homes soon. We have two ewes bred (hopefully) so we'll probably have 4 lambs this spring -a small year for us. I was totally in AWE and mesmerized by your lace pictures! What amazing stuff and so beautiful! Well, it smells like the huge sweet potato I put in the oven (about 1 1/2 hour ago) is almost ready, so I'd better get with making the rest of our dinner. I bookmarked your blogs so I could come back & read more about your fiber work & check out what Rascal has been up to. My last cat was a house panther to the fullest extent. It really does seem like each type has their own personalities - Neelix is so full of bravado, while Sinda (who is 1/2 Siamese) is very refined, but tends to whine a lot - and I see those same traits in the other ginger cats and tuxedo cats. Where would our lives be without them, Huh? Didn't mean to write a book - Later :-) T.